Not since contaminated bathtub gin claimed lives during Prohibition has a spirit been saddled with as insalubrious a reputation as tequila. 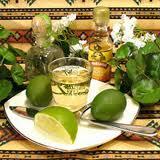 On North American shores, it has long been the domain of Spring Break and body shots while, in its native Mexico, tequila is (and always has been) a sipping drink to be enjoyed with food − an Old World practice that was likely inspired by the Spanish conquistadors, who are credited with creating the spirit in the 16th century. Today, it’s slowly creeping from the bar to the kitchens of innovative Mexican chefs in Canada. “My grandmother used tequila in some of her traditional recipes, and that has been picked up by the culinary industry in recent years,” says Ruben Aceves Vidrio, director of international brand development for Casa Herradura tequilas in Guadalajara, Mexico. “Back then, to include a bit of tequila in cooking was seen as healthy,” just as, now, we consider red wine beneficial to heart health. As the country’s national spirit, tequila is as much a defining characteristic of Mexico’s cultural identity as wine is to France’s and Italy’s. Made exclusively from the heart of the Weber blue agave plant (other varieties of agave produce mescal), tequila is the result of mixing the juice that is milled from the plant with the nectar that is extracted from cooking it.